You found much of a return in wages through death. Our Holy and Venerable Father Bessarion was born in Egypt, and at a young age he withdrew from the world to live the solitary life. 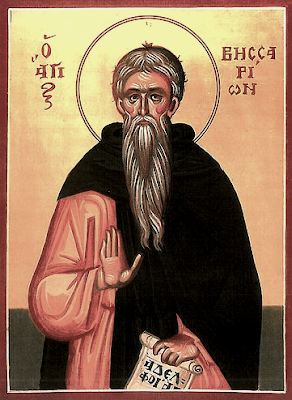 He was initiated into the angelic life by Saint Anthony the Great (Jan. 17), and was a disciple of Saint Makarios (Jan. 19), the founder of Scetis. He then lived the life of a wanderer under the open air, fortified with faith, and overcoming the passions of the flesh. His asceticism was so severe, that he is recorded to have said, "Forty nights I remained standing among thorns without sleeping." "The mode of life of the old man was that of the birds of the heavens, and of the things which are in the waters, and of the creeping things of the earth, and he passed the whole period of his life in peace, and in tranquility; for no anxiety as to the condition of his cell was ever present with him; and his soul was never occupied with the desire to live in certain places; and he never ministered during the whole course of his career to the satisfying of himself with food; and he never gathered together or laid up for himself possessions in clothes or books; but he was free from care about everything which concerned the body, and he rejoiced in the hope of the good things which were to come; and he was firm and immovable in the foundation of his faith; and he followed the ascetic life strenuously. He wandered hither and thither like one possessed, in the season of frost he went naked, and he was consumed with heat under the fierce rays of the sun, and at one time he lived among the rocks and at another in the desert. And if it fell out and happened that he came to districts which were settled, or to a place where a congregation of monks passed their whole lives together in the fulfillment of the rules of monasticism, he would take his seat contentedly outside the door of the monastery. Now on one occasion, having arrived at a certain monastery, he sat down outside the door, and he wept and wailed aloud after the manner of one who had been saved from a storm at sea; and when one of the brethren had gone forth, he found him sitting there like any ordinary poor man or beggar, and having drawn nigh unto him compassionately he said unto him, 'Why do you weep, O man? If you have need of any of the necessaries of life, so far as in my power lies, I will give it unto you. Rise up, then, and get inside the monastery, and comfort yourself with the blessed companionship of the table with us.' Then the blessed Bessarion answered him, and said, 'Until I find the possessions of my house which I have lost, and the numerous goods of the house of my fathers which I have lost in sundry and diverse ways, I cannot live under a roof. For pirates fell upon me at sea, and a storm rose up against me, and I have been stripped of my riches, and from being a man of high degree I have become the object of contempt.' Now that brother was astonished at these words, and was grieved thereat, and he went in and brought out some bread, and gave it unto him, saying, 'Father, take this, and the other things which you have mentioned, that is to say, country, and family, and riches, God shall restore unto you.' But Abba Bessarion cried out the more, and with louder cries, and lifted up his voice and said, 'I know not if I shall be able to find that which I have lost, and that which I seek, for as far as I can see they will be removed from me still farther. And I am afflicted daily, and am brought nigh unto death by reason of the violent storm of wickednesses innumerable which surround me, and I endure them and rest upon hope that, peradventure, I may be worthy of mercy in the day of judgement.'" “The history of the triumphs of Bessarion say that during all the days of his life he dwelt in deserted places, and in the desert and in the mountains, and among the rocks. Once having come to a certain monastery, he stood up by the door like a wandering beggar, and then sat down weeping and crying out, even as one who had been rescued from a storm. And when the brethren entreated him to go in and rest with them, he said, ‘Before I find the possessions of my house which I have lost I cannot endure being under a roof; for thieves fell upon me at sea, and a storm reared itself up against me, and I have been robbed of the riches which I once possessed, and from being a man of high estate I am become of no account.’ Now what were the riches which he inherited from his parents and lost? And what does this story mean? Who are the parents? What does he refer to by the words sea, and storms, and waves? Who were the thieves? Are these words spoken of himself or of other persons?" The old man said, "These things are said of all the monks who are still striving and contending against passions and devils, and who are lacking at the present time purity of heart, and fruits of the spirit, and visions of our Lord, and they are not spoken of men who are perfect as he was. The word ‘sea’ he applies to the sea of the nous whereon the monk sails with works of spiritual excellence, wherefrom he enters the haven of impassibility, even as the blessed Makarios says, ‘He who wishes to cleave to the sea of the nous, makes himself longsuffering.’ And he calls temptations ‘storms,’ and the passions ‘waves,’ and the ‘thieves’ are devils, and his ‘parents’ are the Father and the Son and the Holy Spirit, One God, in Whose image and likeness we are made, even as our Creator said, ‘Come, let us make man in our image and likeness,’ and also as our Lord said, ‘Be like unto your Father, Who is in heaven.’ And He calls the spiritual excellences, which contain likenesses of the similitude of our Father, Who is in heaven, and which make us heirs of God, and sons of the inheritance of Jesus Christ, by the name of ‘riches and possessions of his parents,’ and these are faith, and hope, and the love of God and man, and joy, and rest, and peace, and graciousness, and pleasantness, and lowliness, and humility, and longsuffering, and patient endurance, and integrity, and simplicity, and purity, and mercy, and cleanness of heart, and the holy light of the nous, and pure prayer, and the divine light which riseth on the heart at the hour of prayer, and spiritual prayer, and Divine knowledge, and the visions and revelations of our Lord. These are the possessions of the soul, some of which it acquires naturally, and some by Divine Grace; now those which it acquires naturally are they which the Creator sowed in its nature at the beginning of its creation, and those which it acquires by Divine Grace are they which are bestowed upon it by the baptism in Christ. And these possessions are lost to a man through pleasures, and honors, and lusts, and benefits, but they are found and acquired, and the soul waxes rich in them, through tribulations, and revilings, and oppression, and hardships. Now although Abba Bessarion, and men who were as perfect as he was, possessed these things, other men lack them and are strangers unto them. And as regards the words: ‘He once came to a certain monastery, and sat down outside the door like a wandering beggar,’ they mean that he saw clearly with the secret eye of the nous that the greater number of the monks were destitute of this spiritual possession, and of the spiritual excellences and gifts which have been already mentioned. And being incited there, by the law of affection and of brotherly love, he cried out and wept on their behalf, as if it had been on his own, and he made supplication to the loving-kindness of God that He would make them worthy of the riches of His love, and of the possession of His Grace." And on another occasion we were journeying to a certain great sage, and the sun was nigh to set, and the old man prayed, and said, 'I beseech You, O Lord, to let the sun abide in his place until I come to Your servant;' and it was so. And on another occasion I came to him in his cell that I might speak with him, and I found him standing up in prayer, with his hands stretched out to heaven, and he remained standing up in this position for four days and four nights; and afterwards he called me, and said unto me, 'Come, my son,' and we went forth and set out on the road. And being athirst I said unto him, 'My Father, I am athirst.' Then he removed himself from me about the distance of a stone’s throw, and prayed and came to me, and he brought with him his garment filled with water from the air, and I drank, and we traveled on our road until we came to Lycus, to Abba John. And after each had saluted the other, he prayed, and sat down, and he discoursed concerning the vision which he had seen, and Abba Bessarion said, 'A decree of judgement has gone forth from the Lord, that all the temples of the idols be blotted out;' and this actually came to pass, for at that time they were all uprooted. And there was in Egypt a certain man who had a son that was a paralytic, and he took him on his shoulders, and brought him to Abba Bessarion and left him by the door of his cell weeping, and he departed and went to a place some distance off. Now the old man heard the sound of the weeping of the young man, and he looked out, and seeing him, said unto him, 'Who are you that are here?' And the young man said, 'My father brought me here and then went away, and I weep.' Then the old man said unto him, 'Rise up, hasten after him, and overtake him;' and straightway the young man was made whole, and he went to his father, who took him and departed. And on another occasion there came to the church a man who had a devil, and prayer was made on his behalf in the church, but the devil did not go forth, for he was difficult to cast out; and the clergy said, 'What shall we do about this devil, for no man can cast him out except Abba Bessarion? Let us entreat him concerning the man, and even though he comes not to the church, let us act thus. Behold, the old man comes to the church early in the morning before everyone else. Let us make the sick man to occupy the seat wherein the old man sits usually, and when he comes in, let us stand up in prayer, and say unto him, O father, make to rise up this man also;' and they did so. And when the old man came into the church in the morning, they rose up in prayer, and said unto him, 'Father, make to rise up that brother;' and Abba Bessarion went and struck him with his fist, and said, 'Rise up and go forth;' and straightway that devil went forth from the man, and he was made whole immediately." Thus Abba Bessarion can be compared to the prophets of old: to Joshua the son of Nun who caused the sun to halt in its course; to Moses and Elijah who brought forth water; and to Elisha who crossed the Jordan with the mantle of Elijah. Hence, when Abba Bessarion reached deep old age, he departed in peace to the Lord, where he now rests from his labors.